The restaurant is independently owned. I’m not sure how long it’s been open but it’s been there since around 2008 at least anyway. The restaurant itself is quite small – it only has room for around 30 covers or so. Booking is pretty much essential as they can get quite busy. I love the decor – it’s quite quirky with signs and little statues and paintings everywhere. Also because it is so small, the atmosphere is quite cosy; rather like you’ve gone to a friend’s house for dinner. I actually went in November 2014 with my sister, OH and a friend but typically selfish of me, I only took photos of my food! 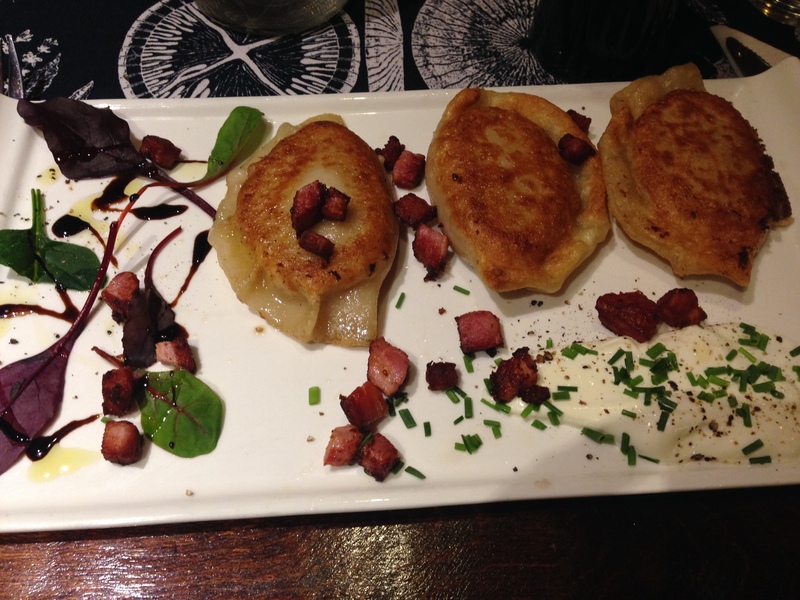 There is always one starter that I always get – pierogi. Always with potato and cheese, not the beef and it’s served with crispy bacon lardons, a little salad and sour cream. This dish alone is worth however many propoints, syns, calories… It is just the most delicious thing I’ve eaten without being too heavy and rich. It’s perfectly golden brown and crisp and fluffy and cheesy on the inside. Yum. For my main, I got the ham shank. Oh my god, it is the perfect winter dish. Unfortunately, the portion was so humongous that I only managed to eat around half and I couldn’t take it home! 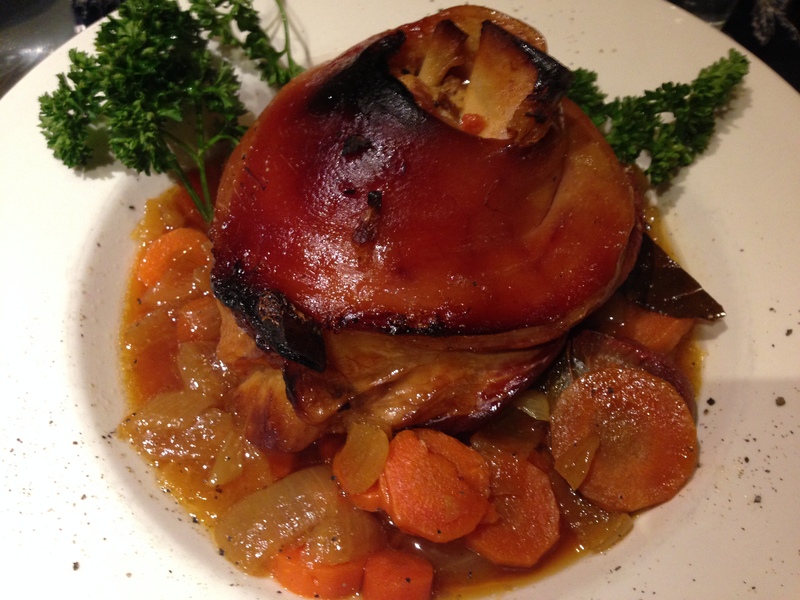 The ham had a crisp skin and salty yet moist meat and there was a lovely broth made from ale on the bottom with some slow roasted carrots and onions. I only ate a small part of the skin but it was just divine. Like crackling but less likely to break your teeth. It had a slightly goo-ey texture to it underneath and just so delicious. Honestly, I can’t find the words to describe how gorgeous it is and perfect to counteract the freezing evening we decided to turn up. Other dishes: I believe OH had a rice stuffed pepper to start and chicken skewers with mediterranean veggies which he confirmed was really nice and very moist chicken. Our friend had the courgette fritters and a ham shank and my sister had scallops to start and a Gressingham duck breast shredded with apple and some gnocchi-style dumplings. Every time we’ve been here, it’s more than lived up to expectations. I think we’ve visited around 4 times now and the repeat dishes are just as good as we remembered with new ones being just as tasty, if not more. I would definitely recommend to anyone, whether you’ve had Polish food or not – the quality and taste is just well worth it. Prices are not too extortionate either with starters between £4.25 and £7.50 and mains priced between £8.79 and £16.75. There are also special boards and during the day it does breakfast and is a cafe/deli with some delicious looking cakes (which my Mum has insisted taste just as good as they look). I also have to mention that the staff there are so friendly and are more than happy to help with any problem or question you might have. I have to say they go above and beyond. So, I realised that I had all these photos backed up from late last year onwards where I was meaning to post some restaurant reviews alongside my other posts. Somehow, I got sidetracked and I thought I might as well get a move on, if only so I can now delete the photos and free up some space on my poor iPhone! Even though my blog is mainly about weight loss and trying to achieve my 130lb goal, part of what keeps you sane is still allowing yourself treats or occasions where you’re not worried about food. I mean, don’t go crazy and eat about ten brownies alongside your pizza and starter of something fried and wash it down with a bottle of wine, but now and again, it’s just what the soul needs. My first restaurant review is of The Hop in York. It’s been open since 2013 and my sister and I decided to pay it a visit in December 2014. It’s known as a craft ale house but we weren’t really into all that (our alcohol intake is usually limited to cider and spirits only) but we did have a massive interest in the wood fired oven which apparently conjured up some delicious pizza. When you first walk in, it is quite similar to any other pub. It’s a little dark and there’s a long bar with spirits lined all along the back. There are quirky quotes written on the walls in the front half of The Hop and then when you walk further in, it opens up to more seating space where the Pizzeria is right at the back. You order at the bar and the menu is quite limited and written on a chalk board on the back wall. Luckily we perused the menu online beforehand and knew what we wanted as otherwise we’d be stood at the wall for a good ten minutes trying to decide! I will tell you now that we ordered way too much food. I think we ate about 2/3 at the very most. We ordered a garlic bread to share (with garlic, olive oil, mozzarella and oregano – £4.50) and I ordered the Fresca (baby courgette, sun blushed tomato, mozzarella, fresh basil and homemade tomato sauce – £7.50) whilst my sister went for the Bosco (Italian sausage, porcini mushroom, red onion, red wine, mozzarella, home made tomato sauce, oregano and topped with rocket – £9). The other choices were a Margherita, Napolentana with anchovies and capers, La Tropical with ham and pineapple and Spicy Pepperoni with Italian pepperoni and fresh chillies. The price was really reasonable for the pizzas and garlic bread. They were all a decent size – I say about 12 inches and the base was just stunning. I am a massive fan of thin based pizzas which take a couple of minutes to cook and The Hop got that perfectly on a plate. The only sad thing was that because it was so big and we couldn’t eat it fast enough, it went cold relatively quickly. I loved all the vegetables on mine and all of the flavours were harmonious. I tried some of the Bosco, which my sister loved, but I think it would have been a bit too heavy for me. I’m not a massive fan of rocket either and I personally don’t think it added anything to the pizza (except some greenery!) and gave the pizza a bit of a bitter aftertaste. The garlic bread was absolutely gorgeous, though a tad too oily. The garlic was nice and powerful but probably not what you’d want to eat on a first date. We didn’t sample any of the beers but I hear from a reputable source that they do a good job. We went on a Monday and it wasn’t very busy but they did have quite a few covers. The atmosphere was nice and laid back but they could invest in actual plates rather than the paper ones the pizzas were served on – though I guess less washing up for them. Also as typical for a pub, there wasn’t much service. The only person we saw were the guys at the bar when we ordered and the guy who brought us the pizza. The pizzas definitely are value for money – they weren’t expensive and the ingredients were high quality. The pizzas would have been enough for two people if they did sides such as a salad or veggies but the menu is limited to the pizzas and garlic bread mentioned above. Overall, it’s definitely a place I would return to. Unfortunately not with OH as he is allergic to both wheat and egg, but this pizza is good enough to rival Il Paradiso further down the road and the ones I’ve had from Toto’s around fifteen minutes walk away. Oh, and bear in mind that they don’t take reservations – it’s first come first served. 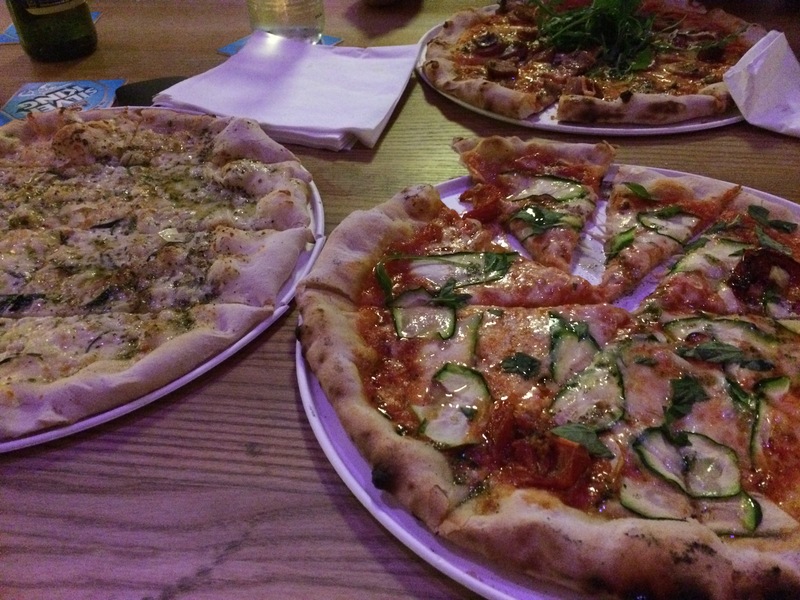 Pizzeria opening times: Mon – Thurs: 12-2:30pm, 5-9pm. Friday/Saturday 12-9pm, Sunday 12-7pm. Visit their website here.